Most Windows users don’t pay much attention to how desktop programs are installed on their system. For years we’ve been trained to seek out a website, download an EXE or MSI file, and then click, click, click our way through the installation. It’s an easy method, but it’s also time consuming because of the manual interaction. A burgeoning project called Chocolatey wants to make it easy to install desktop apps without having to click through an interminable number of installation windows. 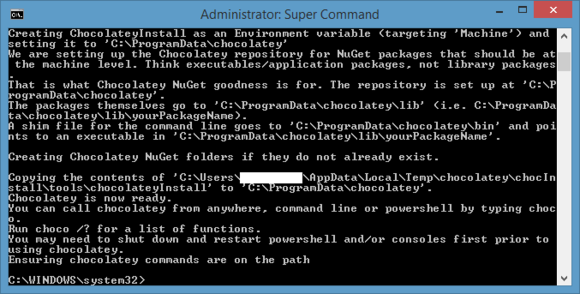 Chocolatey is a command line application installer for Windows based on a developer-centric package manager called NuGet. Unlike manual installations, Chocolatey adds, updates, and uninstalls programs in the background requiring very little user interaction. Chocolatey has its own package feed that is created and maintained by the project’s community members. Behind the scenes, most Chocolatey packages simply download a program’s official executable and install it without any further interaction from the user. No, wait, hear me out! Getting new programs the old fashioned way is very easy, but manual installs are also inefficient. Wouldn’t you rather spend your time checking out the latest cat videos on YouTube while your PC goes about installing programs by itself? With one console command, Chocolatey downloads the installation file from the Internet, and takes care of installation for you. That’s the promise of Chocolatey. If the program has any dependencies, such as the .NET framework, Chocolatey will install those too. 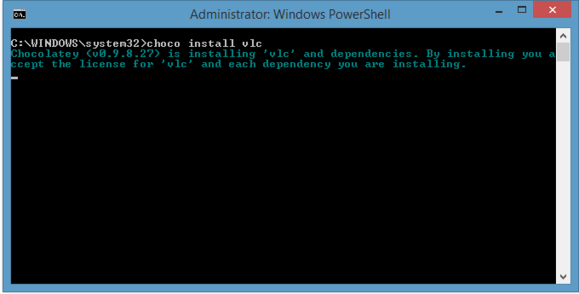 Chocolatey can also take care of multiple program installations. Imagine cracking open a new PC, downloading Chocolatey and then typing a one-line command to install all the programs you’d like to have on your new machine. That's what Chocolatey does. Getting Chocolatey onto your system is very simple since the commands can be copied and pasted into your command prompt from Chocolatey.org. To start, you need to open an elevated command prompt. To open an elevated Command Prompt, right-click on the Command Prompt launcher and select Run as Administrator. To do this in Windows 8.1, click on the Start button and go to the all apps screen. Under the Windows System heading find Command Prompt, right click-it and select Run as administrator. When the User Account Control window opens, authorize it by clicking Yes. A command prompt window should open with something like C:\WINDOWS\system32. Paste it into the prompt, press Enter and your PC will take care of the rest. Installing Chocolatey is almost as easy as installing software with it. Usually doing a copy and paste of commands is not advisable, but in this case it’s just fine. So you can rest easier, let’s break the instructions down a little bit: These commands are telling your PC to launch PowerShell and don’t load any custom profiles a power user might have. Next, it tells Windows to set the execution policy to unrestricted to allow any PowerShell script to be run and then download and run the Chocolatey install script. When using Chocolatey, you have to be okay with agreeing to the license agreements of the software you'll be using. Chocolatey will download the installation file from the web for you. Pretty easy, right? The trick is that you need to know the exact name Chocolatey uses for each program. You can’t just type Chrome or Google-Chrome and expect Chocolatey to figure it out. That basic document structure can include as many programs as you like, and can even include alternative sources other than Chocolatey’s community feed. For a more thorough tutorial on creating a multiple install file, check out developerFusion. On the next page, we'll cover standardized commands and security concerns.